This is my method of lacto-fermenting using a liter jar container.The objective is to prevent air to mix with the jar contents, while the bacteria works its magic.The psuedo anerobic situation is obtained by insuring the jar contents are completely covered with brine. The brine is the barrier allowing gas to escape out since the jar pressure is higher than outside atmosphere. A standard plastic lid fits exactly inside a wide mouth jar. This is placed on top of the contents with hollow side up and a normal lid is placed on the jar and left lightly loose to allow gas (CO2)to escape from the lacto-fermenting process. The device is simple and low cost. 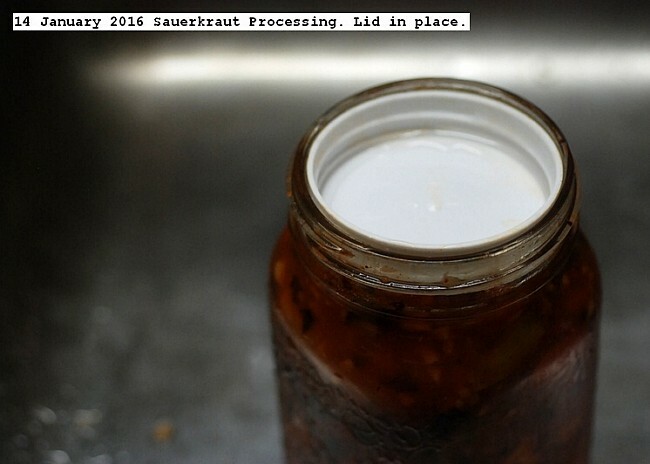 This entry was posted in Uncategorized and tagged Sauerkraut Processing, Sauerkraut Processing in liter jar., Sauerkraut Processing keeping covered with brine., Sauerkraut Processing weighted system. Bookmark the permalink.